Pick the Perfect Contact Lens Option for You! Do you find glasses to be cumbersome? Would you prefer to see clearly all the time? Maybe you’d prefer to not wear frames with that expensive evening dress you just purchased. Or you’ve had one-too-many close calls with your glasses at the gym. Whatever you have in mind, we can help find the perfect contact lens fit & brand for you! Invision offers a wide range of contact lenses to help provide convenience, clarity, and comfort to all patients. We find the best fit for your eyes and your lifestyle. We have lenses for astigmatism and bifocal wearers and carry all the major global brands: Vistakon, Alcon, Cooper, Bausch & Lomb and many others. Monthly disposables and daily disposables are our most popular options. We have thousands of lenses in stock for same day delivery, so you don’t have to wait! The prospect of contacts can be nerve-wracking for some, but the our team is here to help. We provide one-on-one training for contact lens care and handling to all prospective contact lens patients. We show you what to do–and what not to do–to keep your eyes clear and healthy, and guide you through the process. And parents–our kids wear contacts too! We provide the same level of care & attention to our youngest contact lens wearers. For every patient, we strive to teach best practices for healthy eyes and good lens maintenance. When is my child old enough for contact lenses? rule of thumb, we suggest 12 or 13, but some kids need to wait a little longer. Listen to your child, first; if they’re interested in contacts, then pursue the option. Our experience shows that children who initiate the conversation–instead of being pushed towards it–tend to be more successful in adjusting to contacts. While getting contacts can feel overwhelming for both parent and child, our staff provides caring assistance for our younger wearers. If a child is ready for contacts, we will walk them through the process, answer their questions, and give them the confidence to wear contacts. Our fees are competitive with online retailers and what you pay will also be determined by your insurance. We offer discounts when you order a 12-month supply. We offer free shipping directly to your office or home. We also provide any available manufacturer rebates, which vary by lens brand. How often do I need to have an eye exam if I wear contacts? A contact lens is a medical device, which rests directly on the cornea, one of your body’s most delicate and sensitive structures. 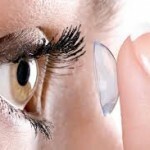 The fit of the contact lens or the integrity of the cornea may change over time, and close supervision is required to ensure safe, healthy, long-term contact lens wear. For this reason, a yearly contact lens evaluation is required to keep your contact lens prescription up to date. This evaluation involves separate tests from the eye exam and has a separate fee. The evaluation fee also covers trial lenses, if needed, and any follow up visits for 90 days to ensure you have clear comfortable vision and healthy eyes. First time wearers also receive one on one training with our staff for contact lens insertion, removal and proper care. Please don’t hesitate to contact us if you have any further questions about fees. Switching to contacts is a big decision, but you can trust our team to help you make the right choice and find the perfect fit! If you’re interested in getting contacts, call us or make an appointment online at Salem or Christiansburg to schedule a contact lens consultation and fitting.